Places dimensions that measure the lengths of arcs and polyarcs. Select one entity, either an arc or a polyarc. It can be helpful to use entity snaps, such as NEArest or MIDpoint to snap right on the arc. 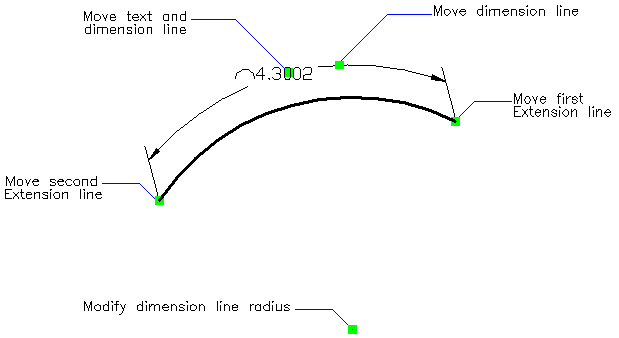 Angle/Text/Partial/Leader/<Location of dimension arc> - Pick a point to locate the dimension arc or choose an option. Select the arc length dimension. Notice the grips. DimOrdinate - places x and y ordinate dimensions. AiDimFlipArrow - flips individual arrows of a dimension. AiDimPrec - changes the displayed precision of existing dimensions.